ALMOST nine months to the day since notching up their first competitive victory, Great Britain men beat Italy 33-24 in Loughborough to secure their second win. It was a fitter and faster GB side which took to the court against Italy at Loughborough University, and after opening up an early lead few would’ve bet against GB making it two wins in a row following last June’s victory over Bulgaria. “The boys played perfectly,” said Head Coach Dragan Djukic. “Our defence and attack was great, and we played right to the end of the match. “This week we have had physical testing and we can see the improvements that all the players have made. “We play Turkey next, and that will be a tough game as they have had a rest day, and they are an experienced team and have players who have been together for ten years. After their good start to the match, GB’s lead was whittled away by some fast moves from Italy, and they were just one behind at the break, 14-13. But GB kept their nerve and as the game went on they forced Italy into long-range shots. Six goals behind with 12 minutes to go, Italy kept battling and pounced on some defensive lapses by GB to keep their hopes alive. However, GB battled on and extended their lead as Italian hopes faded and heads dropped. Steven Larsson (pictured) ended as GB’s top scorer with eight goals, while Martin Hare and Chris McDermott scored six each. 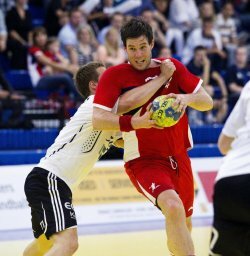 Great Britain v Turkey: Pictures now Online! GB v Italy: Photos now online!